home grown ketchup | eating with S.O.L.E. Today is the day… The burwell general store monthly recipe swap, and this months challenge was both obvious and easy for me to put a SOLE spin on. 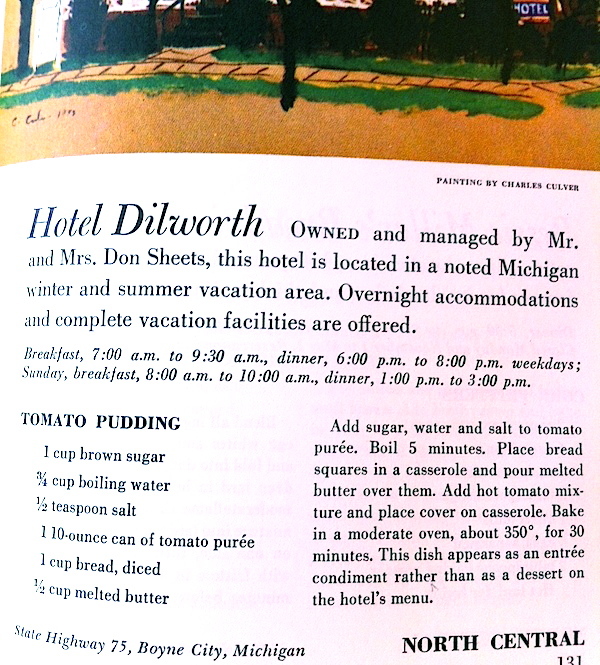 The Dilworth Hotel tomato pudding, was screaming cheese please! .. and so the ketchup project was born. I have done a lot of canned tomato sauces and soups before but today and I decided to process up a batch ketchup with some of my summer harvest of whole frozen tomatoes, the stocks of which are now running low (good thing I have 18 tomato plants happily growing inside) and what better way to edge last years abundance into this seasons decadence! Gourmet home grown home made tomato ketchup. What a treat. This is nothing like heinz ketchup at all, what it is however is tomato-y and lovely, fresh and just a little spicy, with a nice acidic kick, a sauce perfect for dipping, dunking and slathering. Tie bundle and let the works cook down covered over medium heat for about 30 minutes. Remove bouquet and using an immersion blender zip up the sauce to desired consistency. Allow sauce to cook in a 350° oven for 30-60 minutes which will allow the sauce to darken and thicken. Pour hot contents into sterilized jars and keep refrigerated. These should keep for 6 months … but likely they will be long gone before that! I see french fries in your future. Sounds delicious! I have to try making my own ketchup! Yes do! it’s fun and easy, and so rewarding! What a happy day indeed!!! 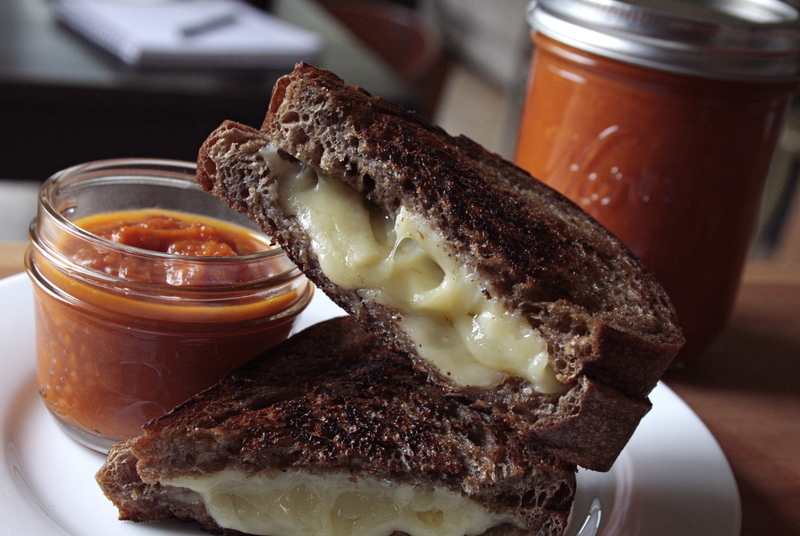 That looks like such a perfect ketchup recipe and that grilled cheese is divinity itself. Great swap. Yum! Thanks, and yes divinity is melted cheese, and my perfect happy day. This looks delicious. 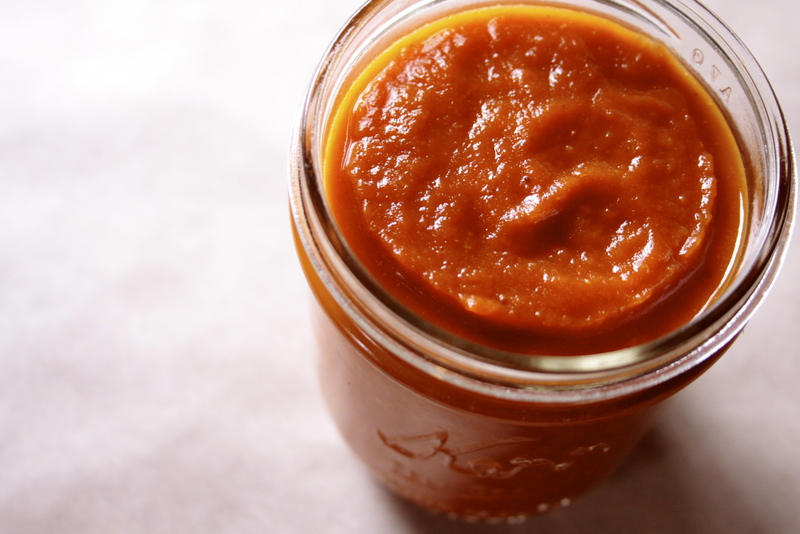 I found a homemade ketchup recipe that we just loved last year. I can hardly wait for fresh tomatoes this summer to make some more! I am coddling my tomato starts right now… dreaming of basketfuls this summer! oh summer sun warmed tomatoes. I looooove it!!!! As soon as tomatoes come in here in SoCal, I’m trying this. What a reverent take on the original recipe! Thanks so much, great pick this month btw! fantastic! wow! that ketchup looks perfect! I’ve never made it , but would love to try! thanks so much! It is easier than jam to make… and so much more versatile! I made my own ketchup last summer for the first time and now I’ll never go back to buying it! I love your version– looks so bright and fun! Plus you totally won my heart with the grilled cheese sandwiches…. I seriously eat a grilled cheese sandwich almost every night for dinner. 🙂 What a great contribution to the swap! Cheers, I have built meals around ketchup for the last two nights! I could so totally eat grilled cheese a few times a week no problem! I’ve never made ketchup and yours looks so good. Your grilled cheese is also awfully tempting:) Nice job for the swap! My daughter is a ketchup fiend…ketchup on everything. She moved into her own apartment (finally) after working for a year after graduation and I was free to rid my home of that product I had come to hate…she ruined such perfectly good food with a dose of ketchup. But now…oh yes I can see myself becoming a fiend over this…and the idea with grilled cheese is perfect. GREAT swap! Too much of a good thing can be bad indeed! We are having a similar experience at my house with hot & sour soup right now! I have tried twice to comment on your lovely salad.. and I keep getting failure connection messages. I was green with envy over your tomatoes magically arriving at your door! lucky. oh dear, now I have ketchup on the brain! I love the stuff but have never tried it with grilled cheese, nor have I ever made my own! It sounds too good to be true. If I made my own ketchup, will the bottled variety ever be worth eating again? Ha ha, seems to be lots of folks wondering just that! I think that this home made stuff is lovely, but it is very different than the store bought, way less sweet, and more rich and tomato-E. 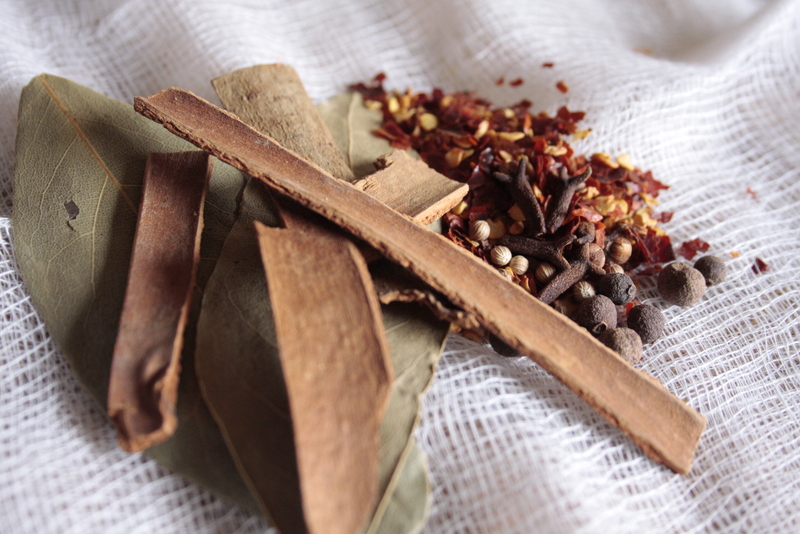 I still like the organic varieties we have been buying for a while made by Simply Natural.. I guess the difference is akin to grainy gourmet mustard vs. straight up yellow mustard… Some times your in the mood for indulgent, some time straight up old school works just fine! I certainly recommend trying to make some, it’s no big deal and soooo worth all the effort! mmm I would love to see a Serbian ketchup recipe! Oh my goodness your grilled cheese looks good…I could eat 1 or 2 of them, and I just ate dinner 🙂 Your ketchup sounds so flavorful with all the lovely spices you put in it! Thanks so much.. funny thing, I have been craving grilled cheese ever since this post! barley mushroom cheesy bean balls | eating with S.O.L.E. honey cream ale mustard | eating with S.O.L.E. green tomato ketchup | eating with S.O.L.E.